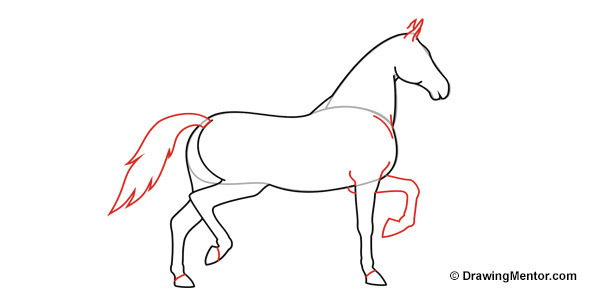 Welcome to our drawing tutorial on how to draw a unicorn. A very popular magical creature with an iconic long horn. The conventional unicorn form is depicted as a white horse-like animal with a long spiraled horn protruding from its forehead. Unicorns have been described to have magical abilities, such as its tears and blood that can heal. The word unicorn means ‘one horn’. Archeologists discovered cave drawings in France that depict a horse-like animal with one horn. Next we’ll use the guide shapes to draw the outline of the body. Start with the head adding the mouth line and curved line for the cheek. Then add the front leg. Now add the back leg so it’s bent at 45 degrees. Now add the back leg on the far side which is positioned straight down. It’s time to add a bushy tail. Then add the ears pointing up, the front leg that’s raised and bent. Then add lines to show the unicorn hoof sections. Now add a line from the back leg up into the body to show the thigh. Then add the beautiful mane and finally the iconic spiralled horn sticking out from the head. Let’s add some details. A a few lines on the legs to define the large muscles in the legs. See image for placement. Now add the eye and nose. And we’re done! Go ahead and colour your unicorn anyway you like to make it even more magical! If you enjoy learning how to draw a unicorn, you may also like these!